Pictured are CCCDG Board Members Bob Hauber, Tom Blake, Lanny Kuehl, and John Finley; Chris Hopp, Alpine Communications; Sue Cosner, Community Initiatives, IADG; and Hollee McCormick. 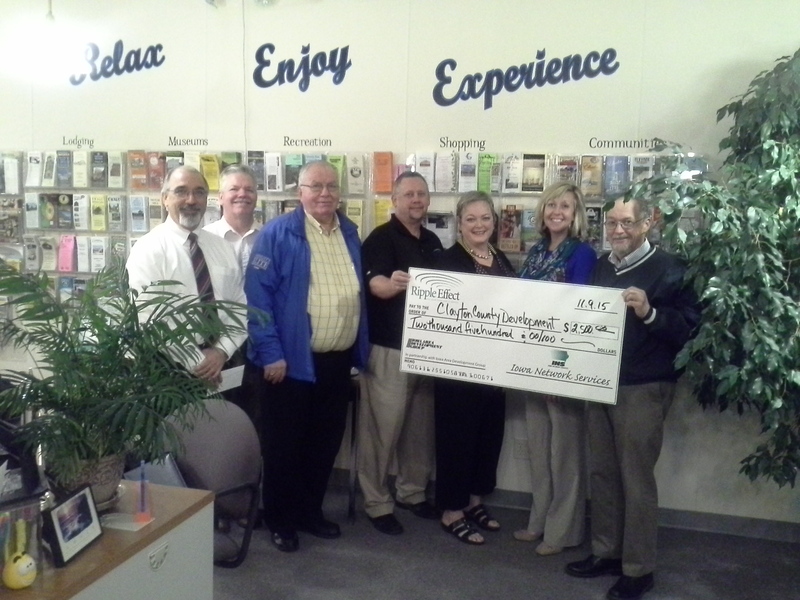 West Des Moines, Iowa, November 9, 2015 – Iowa Network Services (INS), located in West Des Moines, Iowa, announced the award of a $2,500 Ripple Effect grant to the Clayton County Development Group (CCDG) in Elkader, Iowa. The INS grant was matched with another $2,500 by Alpine Communications, the city’s full-service telecommunication provider. The grant will help fund the development group’s efforts in completing a county-wide housing needs assessment. This study will provide data on the inventory and condition of existing housing in cities throughout the county, and determine the need for new housing construction including owner-occupied and rental projects. Additionally, the study will aid CCDG’s efforts in pursuing funding opportunities for housing projects. “INS supports Clayton County Development’s leadership in conducting the housing needs study of the cities in the county, we are proud to help fund this effort and pleased we can partner with Alpine Communications,” states Mike Eggley, Chief Operating Officer of INS. The Ripple Effect program, a partnership alliance between INS and Iowa Area Development Group (IADG) is designed to advance the business and community development vitality of rural Iowa by joining local Independent Telecommunications Companies and partnering municipalities in their economic development initiatives. The program provides financial and technical assistance to business and industry and communities, through local telecommunication providers, to stimulate growth and development in rural Iowa. The program makes available low-interest loans to business applicants and planning grants to communities and their economic development partners for various types of community development projects. The Independent Telecommunications Companies are required to match the local financial assistance provided by Ripple Effect. Other Ripple Effect services include financial packaging for development projects; research and education; awareness and training; business marketing and outreach; and development project facilitation including direct financial assistance through loans and grants from INS. For decades INS, through Iowa’s Independent Telecommunications Companies and IADG, on behalf of the Rural Electric Cooperatives, have provided leadership, vision and commitment to rural communities. For more information about this grant or the Ripple Effect program, contact Susan Cosner, Vice President, Community Initiatives, IADG; scosner@iadg.com, 515-777-7308; www.rippleeffectworks.org and www.twitter.com/@insrippleeffect. Iowa Network Services (INS) was founded as a “centralized equal access” company in the United States. Privately held by 122 Iowa Independent Telecommunications Companies, INS has had middle mile fiber optics in place since 1989. The INS Network delivers the latest in telecommunications services and continues to expand. Telephony, core network transport, Internet, dedicated fiber, Internet Protocol video, data center facilities, network management, technical support and call center services, information technology, and HR outsourcing are among the many products and services offered to communications companies and enterprise businesses. The INS Family of Companies includes Alliance Technologies, Inc., an information technology company; Alliance Connect, a statewide competitive local exchange carrier; Merit Resources, a Professional Employer Organization; and Caleris, an Iowa-based company offering outsourced call center solutions and services primarily to telecommunication and technology businesses. INS also is affiliated with iWireless, a statewide cellular partner with T-Mobile. For more information, visit www.IowaNetworkServices.com. About Iowa Area Development Group (www.iadg.com) The Iowa Area Development Group is the marketing and business development office for nearly 250 of Iowa’s member-owned rural electric cooperatives, select municipal electric utilities and independent telecommunication companies. IADG has assisted with over 2,000 successful business expansions and start-up projects. This growth represents capital investment of more than $10 billion and 50,000 jobs for Iowa. The Iowa Area Development Group was established in 1985 to promote and strengthen rural Iowa development opportunities. Stay connected with IADG news at www.facebook.com/IADG.IA and www.twitter.com/IADGIOWA.